This book analyses the novels of Salman Rushdie and their stylistic conventions in the context of Indian popular cinema and its role in the elaboration of the author’s arguments about post-independence postcolonial India. 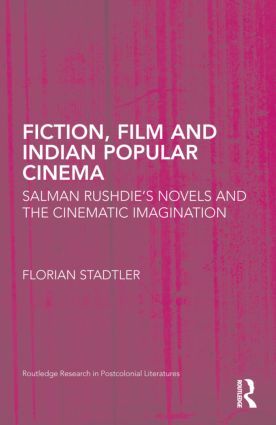 Focusing on different genres of Indian popular cinema, such as the ‘Social’, ‘Mythological’ and ‘Historical’, Stadtler examines how Rushdie’s writing foregrounds the epic, the mythic, the tragic and the comic, linking them in storylines narrated in cinematic parameters. The book shows that Indian popular cinema’s syncretism becomes an aesthetic marker in Rushdie’s fiction that allows him to elaborate on the multiplicity of Indian identity, both on the subcontinent and abroad, and illustrates how Rushdie uses Indian popular cinema in his narratives to express an aesthetics of hybridity and a particular conceptualization of culture with which ‘India’ has become identified in a global context. Also highlighted are Rushdie’s uses of cinema to inflect his reading of India as a pluralist nation and of the hybrid space occupied by the Indian diaspora across the world. The book connects Rushdie’s storylines with modes of cinematic representation to explore questions about the role, place and space of the individual in relation to a fast-changing social, economic and political space in India and the wider world. Introduction. 1. Creating ‘Imaginary Homelands’ 2. Heroines, Mothers and Villains: Cinema and Postcolonial National Identities in Midnight’s Children and Shame 3. Filming Rushdie: From Documentaries, Film Criticism to Screenplays 4. The The Satanic Verses and Shree 420: Negotiating Identity through Indian Popular Cinema5. The Moor’s Last Sigh: Rewriting Mother India 6. The Ground Beneath Her Feet and Fury: Bollywood, Superstardom and Celebrity in the Age of Globalisation 7. Rushdie’s ‘Mission Kashmir’: Mughal-e-Azam and Shalimar the Clown. Conclusion.